Kenmare News | Sheen Falls becomes and Enchanted Forest! Sheen Falls becomes and Enchanted Forest! Rising international fashion designer, Colin Horgan who has dressed Lady GaGa, Rita Ora, Little Mix and Dua Lipa, made a much anticipated return to his native Kerry as the Special Guest Designer at Irish design showcase ‘An Enchanted Forest’ on Midsummer’s night , Thursday 21st of June, in the spectacular natural setting of Sheen Falls Lodge. The show focused on sustainable fashion and designers featured included Sarah Murphy, Alice Halliday, Carol Kennelly, Tina Griffin, Hazel Comyn, Helen Steele, Aoife Hannon, Delphine Grandjouan, House of Kerry (silk scarves) and emerging young talents Siobhan Heffernan and local talented designer Rita Zachar. The evening commenced with a fine wines and canapés reception in the summer sunshine outdoors before moving for the main show within Sheen Falls, which was transformed by creative director Ann Marie O’Leary in an enchanted forest using locally foraged materials. 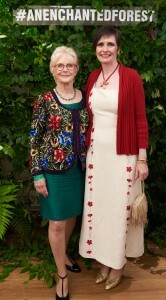 The best dressed on the evening was Joann Murphy who wore head to toe Irish design including pieces from Joanne Hynes. The evening was produced by fashion & lifestyle professional Orla Diffily, who is also a stylist on RTE Today and has co-produced KFW Fashion Week and the Ireland Fashion Showcase New York.